Just like your body, your skin has an immune system. And if your skin's immune function is strong, your skin will be clear and more vibrant. But both our body and our skin's immune systems slow down and become less efficient as we age. You probably know that you can boost your body's immune system by eating right. And you can do the same thing for your skin by "feeding" it with the right ingredients applied topically. What's the first vitamin you think of when it comes to supporting your immune system? If you said vitamin C, you're not alone. Many of us reach for vitamin C at the first sign of an infection, and this vitamin is great for the skin as well. Vitamin C comes in both water- and oil-soluble forms. And if you can combine the two, there's nothing more impressive for enhancing the skin's immune system. But vitamin C isn't all your skin's immune system enjoys. 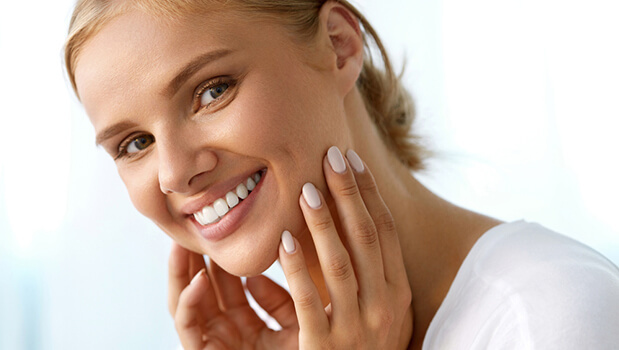 Panthenol, otherwise known as vitamin B5, is another great vitamin for skin health. It's a natural hydrator that can moisturize, soothe, and regenerate skin, making dry skin smoother and more elastic. Panthenol is also a potent natural anti-inflammatory that eases irritation and inflammation. In fact, studies show that it can speed the healing of skin wounds by 30%. Another study found that the addition of panthenol in lotion helped maintain skin integrity. And the fewer invaders the skin's immune system has to deal with as a result of wounded or dry, cracked skin, the more attention it can devote to helping you look your best. Next up is niacinamide, or vitamin B3, which revives the skin's healthy texture by enhancing circulation to the skin. This brightens the tone of the skin, ultimately improving your appearance. In fact, one study found that using niacinamide reduced fine lines and wrinkles, hyperpigmented spots, red blotchiness, and sallowness. It also improved elasticity. Finally, you can feed your skin fermented resveratrol, a true game-changer when it comes to younger-looking skin. In one 28-day study, researchers divided volunteers into two groups. One group applied a lotion containing fermented resveratrol extract to their faces, while the other group applied a placebo. By the end of the study period, the group using the fermented resveratrol had experienced a dramatic change in their skin firmness, facial elasticity, and overall appearance. The placebo group didn't notice any changes. Other studies have found that fermented resveratrol can lift skin, making sagging less noticeable; promote collagen production; increase overall skin firmness; and prevent skin irritation and inflammation. Once again, the reduction in irritation and inflammation will help your skin's immune system function optimally. Clearly, the right "diet" of vitamins and nutrients can go a long way toward helping your skin look and perform at its best. Fortunately, you can get all of these nutrients and more in the Systéme 41 line of products. We designed it with your skin's overall health in mind because healthy skin is beautiful skin!